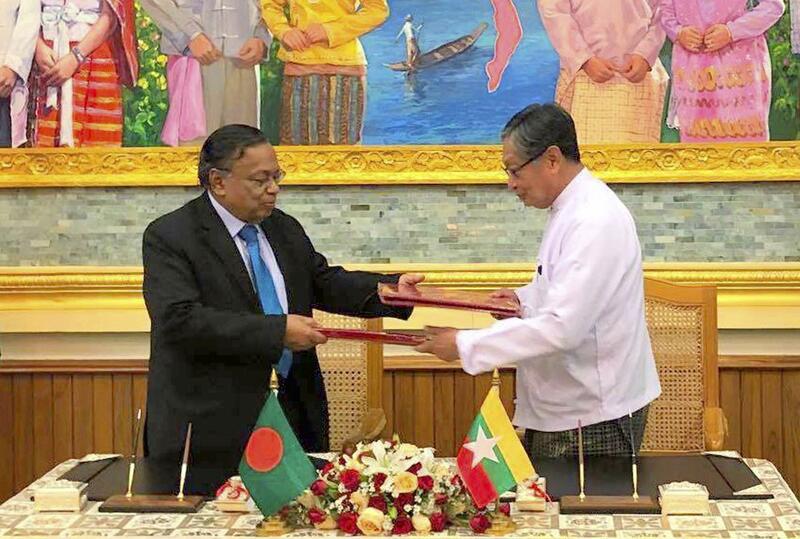 Thu., Nov. 23, 2017, 11:12 a.m.
BANGKOK – Myanmar and Bangladesh signed an agreement on Thursday covering the return of Rohingya Muslims who fled across their mutual border to escape violence in Myanmar’s Rakhine state. Myanmar announced the agreement but provided no details on how many Rohingya refugees would be allowed to return home. Bangladesh said the repatriations are to begin within two months. More than 620,000 Rohingya have fled from Myanmar into Bangladesh since Aug. 25, when the army began what it called “clearance operations” following an attack on police posts by a group of Rohingya insurgents. Refugees arriving in Bangladesh said their homes were set on fire by soldiers and Buddhist mobs, and some reported being shot at by security forces. The office of Myanmar civilian leader Aung San Suu Kyi said the agreement “on the return of displaced persons from Rakhine state” was signed by Cabinet officials in Naypyitaw, Myanmar’s capital. It said the pact follows a formula set in a 1992 repatriation agreement signed by the two nations after an earlier spasm of violence. Under that agreement, Rohingya were required to present residency documents, which few have, before being allowed to return to Myanmar. “They burned our houses, they took our land and cows – will they give us these things back?” asked Abdul Hamid from Hoyakong. Rohingya Muslims have faced state-supported discrimination in predominantly Buddhist Myanmar for decades. Though members of the ethnic minority first arrived generations ago, Rohingya were stripped of their citizenship in 1982, denying them almost all rights and rendering them stateless. They cannot travel freely, practice their religion, or work as teachers or doctors, and they have little access to medical care, food or education. The United States on Wednesday declared the violence against Rohingya to be “ethnic cleansing,” and threatened penalties for Myanmar military officers involved in the crackdown. Published: Nov. 23, 2017, 11:12 a.m.